Over the weekend we dined with some friends at a popular local restaurant. One of the people in our party ordered a glass of scotch, neat. When the drink arrived and was placed on the table, it appeared to be tipping over and all of the diners quickly reached for the glass to prevent a spill. I guess the joke was on us because the glass was designed to wobble in place when set on a flat surface. Upon inspection, we could see a bubble on the bottom-center of the glass. When the wait staff returned, we remarked about the glass and they said that they don’t have spills although it does cause some interesting experiences. **NOTE** – This is an article from Third Shot Sports that is reprinted with appropriate attribution and permissions. The conventional wisdom is that you should always make sure your serve lands in. We don’t want you to hit out either but here is something to consider: if you are always playing it safe for fear of missing, are you losing out on a great opportunity? 1) Aim for a weakness. If you have identified that your opponent has a preferred side (usually their forehand) this is a great time to challenge them to play the shot they don’t want. Use this opportunity to aim near a sideline and force them to hit a tougher return. With each of these suggestions I’m encouraging you to “go for more” when hitting your serve. And yes, there is some risk in doing so. Hitting near the sideline increases the chance that the ball will go wide. 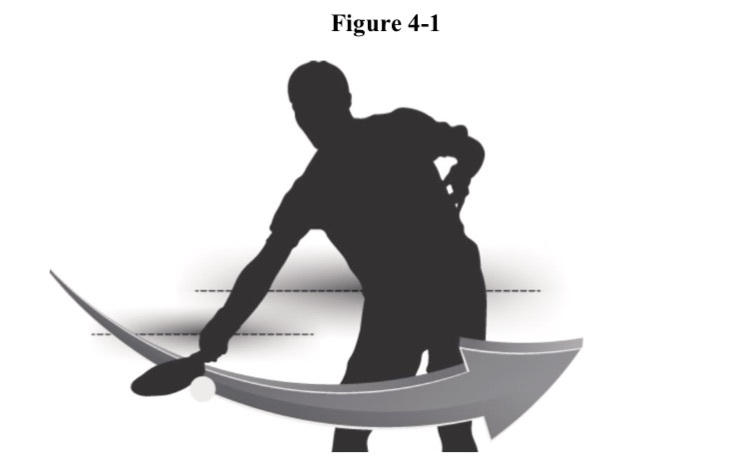 Aiming for the back of the court or trying to hit the serve fast may mean your ball occasionally sails long. Hitting with spin will likely reduce your control and cause you to miss. Of course, if you are hitting many of your serves out of play, you are probably being too aggressive. And one ought to be selective about when they choose to go for more (serving at 9-10-2 might not be the ideal time to attempt an un-returnable serve). But I don’t see anything inherently wrong with the occasional missed serve so long as it is the result of looking to gain an advantage with the first shot. There is an old saying that “if you aren’t falling, you aren’t trying hard enough”. Perhaps we could adapt this to “if you never miss your serve, you aren’t going for enough”. Conventional wisdom is often “safe,” but may not be the best for a given play. Serving is the only time a player has total control of the situation. Still serve the ball deep. Change the style of serve using spin, pace, etc. The comments at the bottom of the article are interesting with people sharing their personal philosophies and ideas. While this may seem like a rather simple video, it delivers an important message. While I see this problem more with beginning players, it also happens from time-to-time with more advanced players. Some pickleballers develop this behavior as a habit and then it is hard to break. One of the keys to winning pickleball is to hit the ball low at your opponents feet. This type of shot is more difficult to return effectively. Nobody wants to be in “no man’s land” because that exposes the player to having the ball land precisely in this hard to return area. After serving, don’t meander toward the net until after the return of serve is played otherwise the opposing team has a chance for a hard return at your feet. The video is very persuasive as Mark Renneson of Third Shot Pickleball, shows how the best players remain behind or very near the baseline until after they have returned serve. I have only been playing pickleball for a couple of years. When I began my pickleball experience and the serve was explained to me, the mantra at the time was “Hit the ball high and deep.” The idea was to keep the players on the opposing team back in the court and away from the net as long as possible and hopefully force a more shallow return because they would then be hitting the ball from an area near their baseline. Instructors would sometimes point out how the serving team is at a disadvantage because they start with both players at the rear or the court while the receiving team generally has one player near the NVZ. Now that younger players and athletes who are coming from other sports are entering the game, there seems to be change in the service philosophy. The serve has been given a new status as perhaps a way to earn the advantage. Change of pace – I do not to use the same serve all the time. This prevents the receivers from knowing what to expect and any doubt in their mind can cause indecision or a poor selection of a return shot. Spin – When using spin, the serve will sometimes cause just enough disruption to throw off opponents. A sudden twist here or there will cause the returning player to make a last minute adjustment which may not allow them to execute the shot they have planned. There are ways to disguise the spin somewhat so it is not anticipated too early in the shot. With all this in mind, I use my general moderately fast, moderately high serve, but if I see a receiver moving up in the receivers box, I may change to hit it hard and fast. From time to time, I throw a spin at them just to keep them guessing. On the serve, ball placement can trump everything else. If I can get the serve angled to the backhand of most of my opponents, I very often get a weak return. If the receiver is protecting their backhand and I can get it down the center line, I often get a weak return. I am only an average club player, but keeping an opponent off-balance has helped me win more points. I don’t necessarily win on a service ace, but as a result of a weak return and winning with a follow up third or fifth shot! I am not an expert and I don’t proclaim to be a coach or instructor so don’t take my word for it. There are excellent players who are coaches and/or instructors and they currently seem to be offering similar advice. And below is a video with Jennifer Lucore, Bob Youngren and Alex Hamner demonstrating a variety of serves. When playing pickleball, one way to gain the advantage when serving to a right-handed person when you are serving from the left service court is to hit the ball to their backhand. Most beginning and average players have a weaker backhand and will return a backhand shot that is easier to handle if they are forced to use their backhand. This is easier said than done in some cases, but you can try to stack the odds in your favor by standing in a better location before serving. 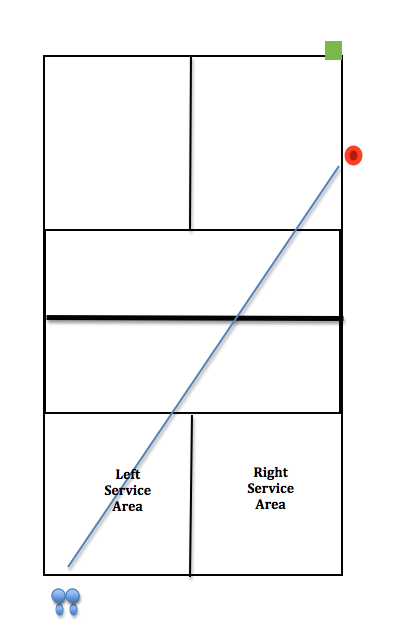 If the serve hits anywhere near the red dot; even a foot or two farther back, the person returning serve (green square) will have great difficulty running around it to hit a forehand. They will most likely have to hit a backhand resulting in a weaker return. Notice where the server is standing in this drawing. They are aligned fairly close to the center line and the angle to hit that spot is very narrow and unlikely to achieve the goal as the line of trajectory shows. 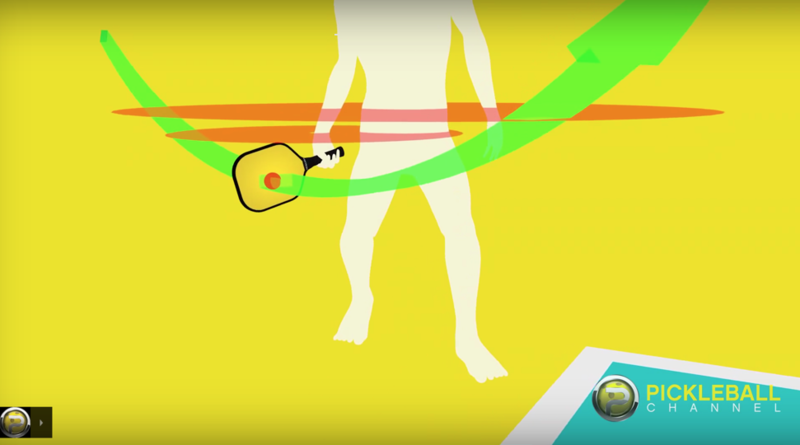 In this scenario, the server has moved far to their left and has increased the angle and margin of error so they have a much better chance of serving the ball near the target area. This would make it very difficult for the receiving player to hit a forehand shot. The video below from Third Shot Sports, demonstrates this in real time. Watch the demonstration and see if this is something you would like to try. When players look at this diagram (below), I receive mixed reactions. Some think it is an illegal serve because it looks like a side-arm swing. Others think that it is legal because it meets all of the elements of a legal serve, but admit it is close. What do you think? Watch the video below to find out! Did you know the three main elements of the serve? 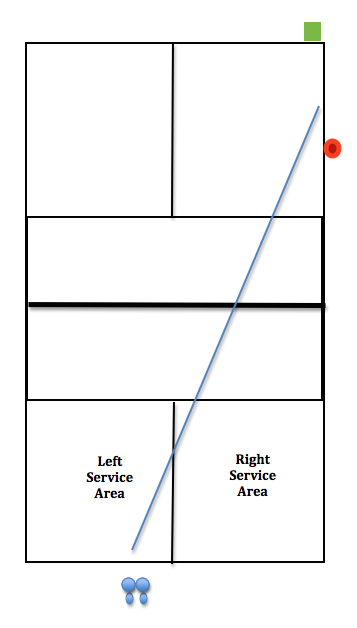 Pickleball – Why Short Serves Are Not Good! 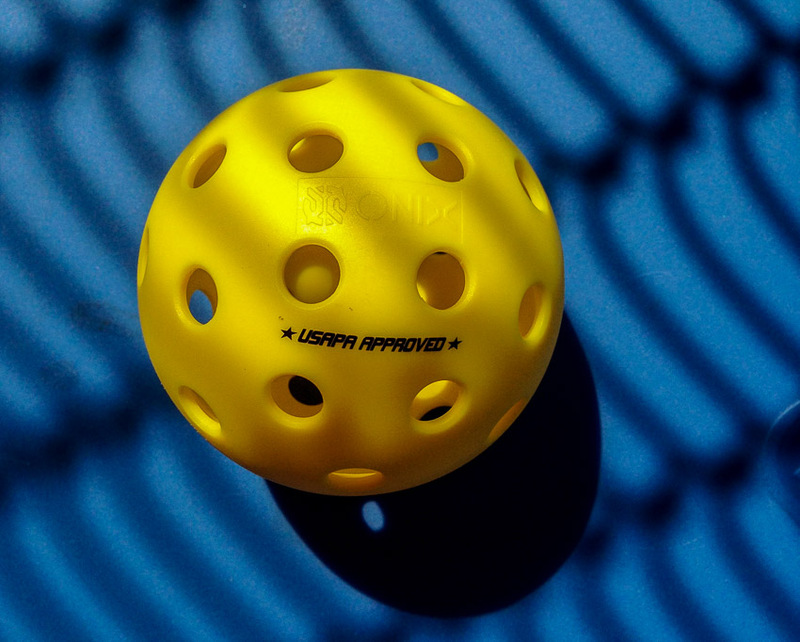 Mark Renneson of Third Shot Pickleball and PB champion explains why it is generally not a good idea to hit a short serve.